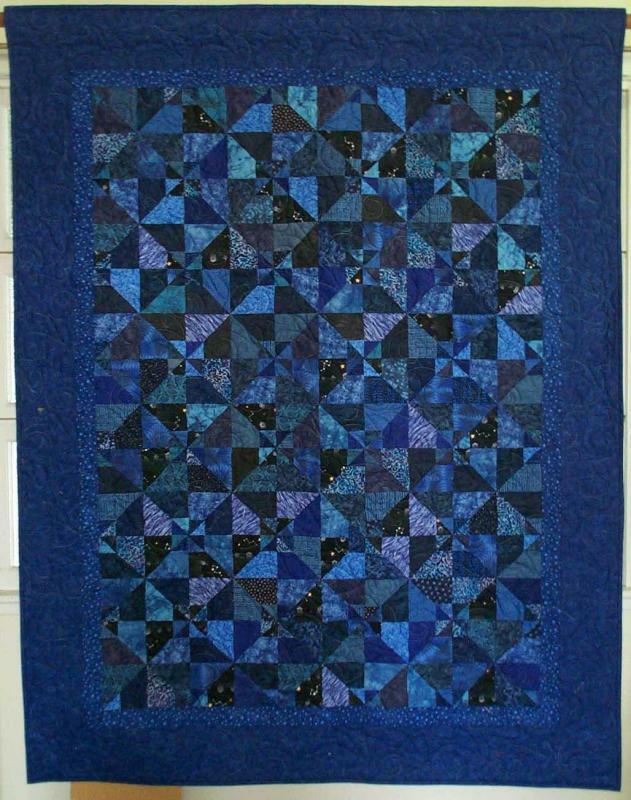 I have been collecting dark blues for 25 years in order to make this quilt (can't find the name right now). But I kept using the blues for other things, and I decided that if I don't make the quilt now I never will. 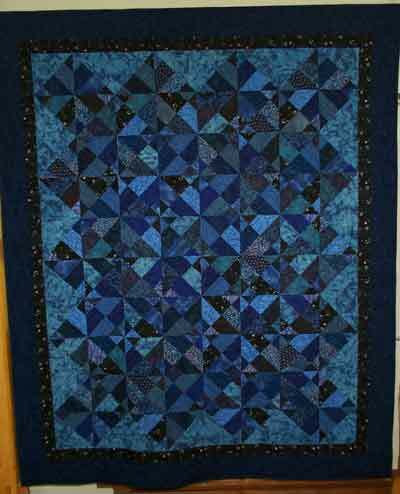 So while I sorted out my blue fabrics I kitted up 20 blocks. I even made one block to test out the cutting requirements. 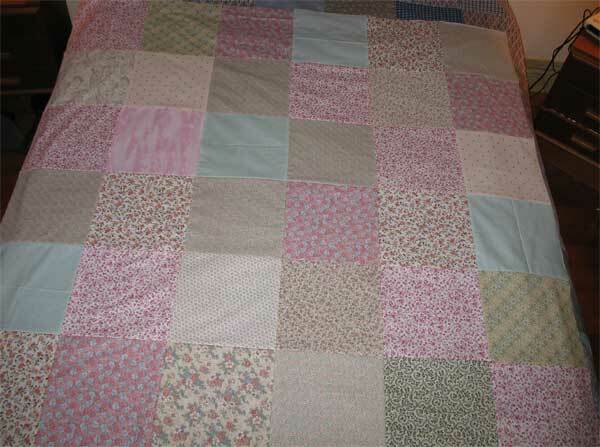 19 to go, a nd I will have my quilt at last. I've also been buying reds for years, in order to make a red and white quilt, and never got round to it. So I decided to cut the pieces for a London Roads quilt, and when I sort out the red fabrics I will cut the pieces and kit the quilt. 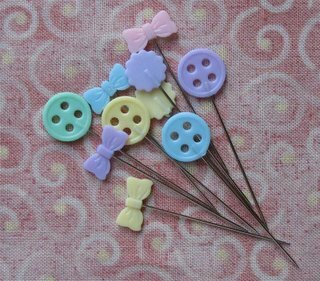 Sewing them will be something for me to look forward to in the long hot summer months to come. I have sorted and counted 7 of my material drawers, and it's been fun. 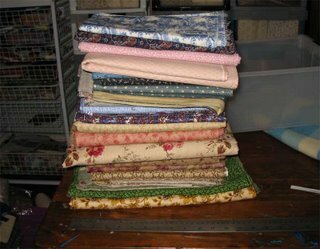 I've got reacaquainted with all my lovely stuff, tossed a lot of lengths I no longer love and added considerably to the scrap bin. Tomorrow I will sit down and cut all the bits into strip s and stow them away in the appropriate drawers. I feel so Organised. I've had a lot of time to think about my Stash, and I'm trying to define what my material means to me. Stash; to put away, as for safekeeping or in a prepared place; a hoard. Hoard; an accumulation for future use. 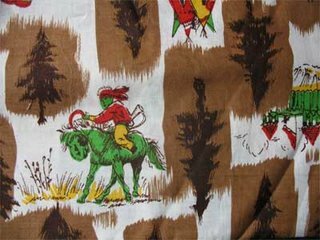 My fabric is falling into two distinct groups. There is the fabric I want to use, to cut up, to include in all my quilts. And there is the stuff that I just want to own, to have, to gloat over. 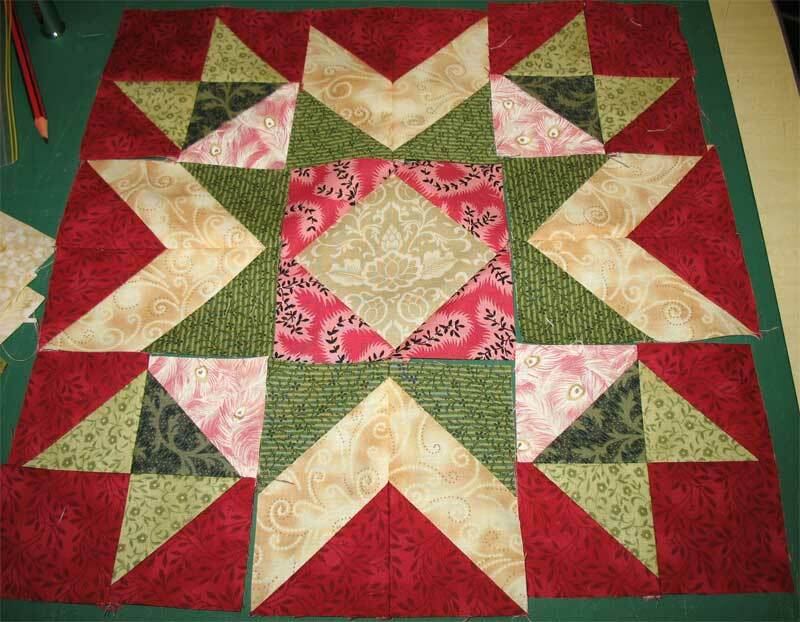 To use someday in a special wonderful quilt. I'm trying to store them so that I have easy access to all the material I want as my 'working' stash, and then my 'preciousss' pieces can be put away where they are safe and I can get them out occasionally and enjoy them. The first one is a piece of our nursery curtains and bassinet covers. 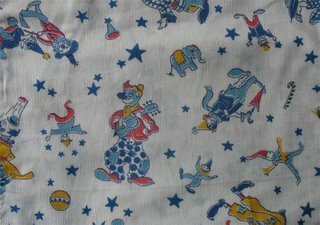 I loathe clowns and always have. 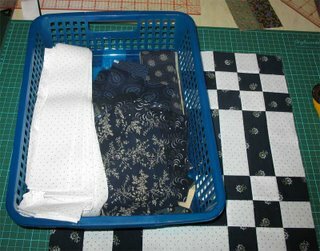 I am still refolding my stash, and measuring as I go. 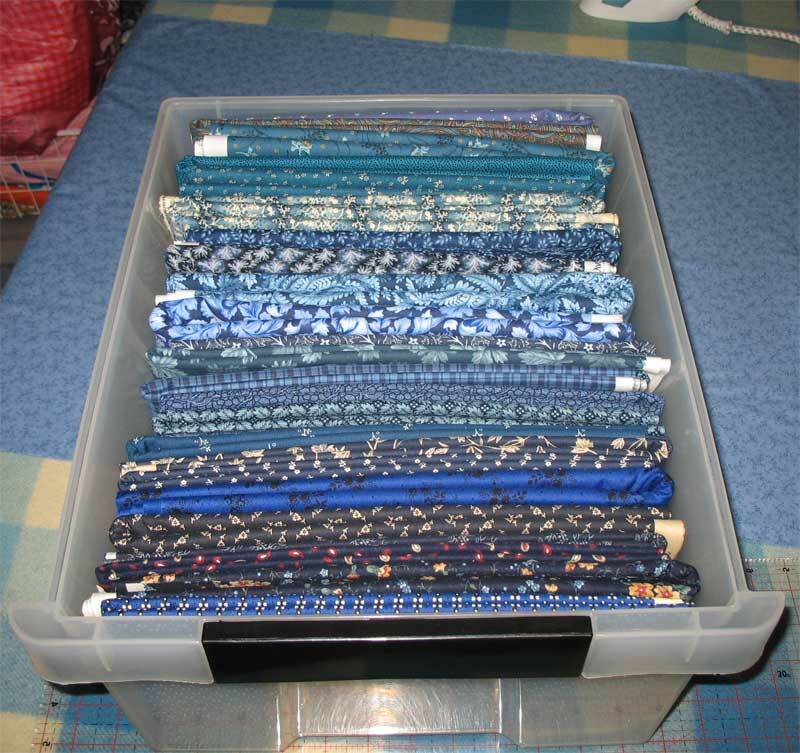 My backing leng ths, florals and blues total 575 metres. Hmmmm, don't know if I'm pleased about that or not. But I really don't have any blues atall, atall. They all fit into a few of these drawers, and when I want to make something I can never find anything that appeals. Maybe because all that's left is the second rate stuff. 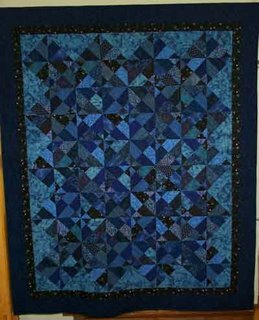 I have made more than 7 blue quilts in the last two years. And my fabric book shows me that I have bought only 15 or so blue FQs in that time. 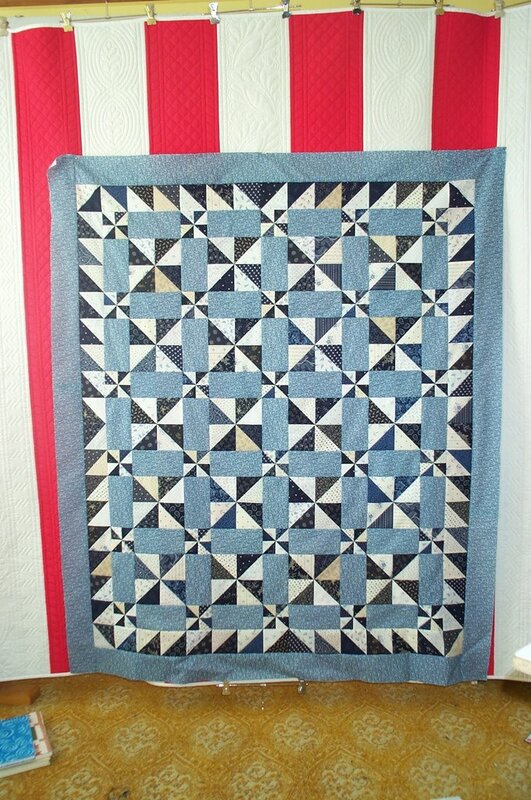 So I really have been shopping the stash for my blue quilts. There are a lot more pieces to deal with, but I will work on it over the next few weeks rather than all day every day. It's tough work dealing with such long lengths; they average out at 5 metres each. The longest piece I have is 6.7 metres; I think that's enough for anything I can imagine. 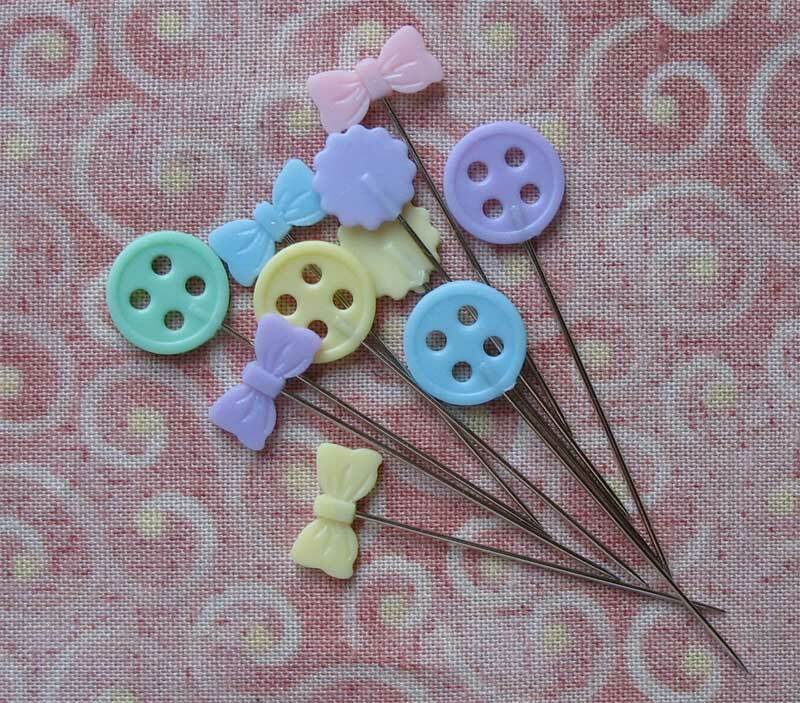 It's been fun re-acquainting myself with some of these; I tend to buy backing lengths on sale, and stuff them away in drawers and not look at them again. Some of them are so beautiful I'm thinking of upgrading them to the good fabric storage, because they're too nice to waste as backings. I haven't achieved any sewing of late, but I've cleaned up and sorted and achieved a lot in the way of organisation, so I'm happy about that. 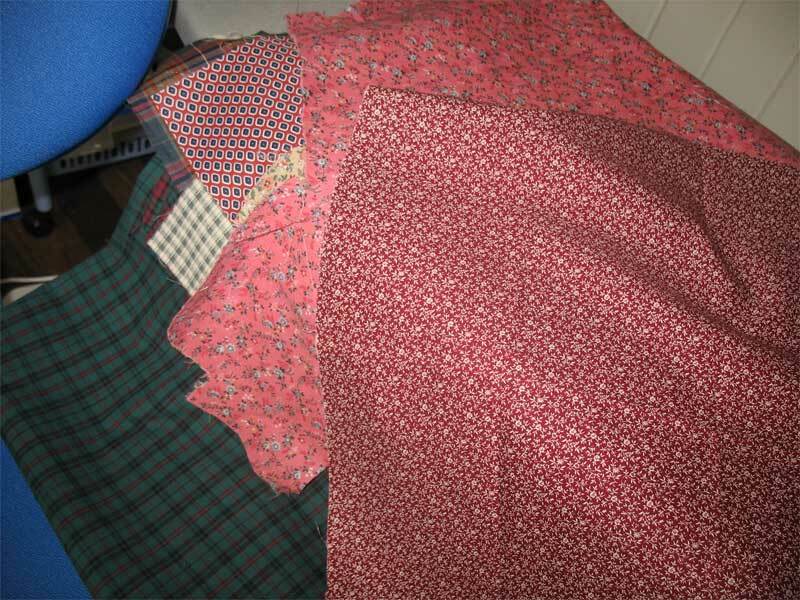 I will be ready to go back to sewing in a few days time once I've finished the clearing up. 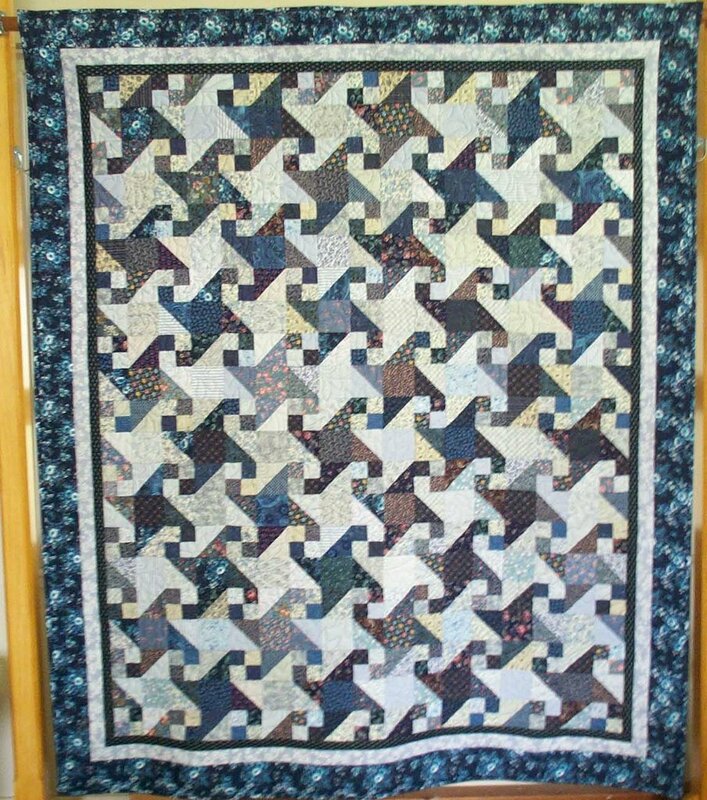 My flying geese quilt that I showed a few posts ago was ma de from 3-D flying geese; it was super easy, and the added fabric layers make it extremely warm. 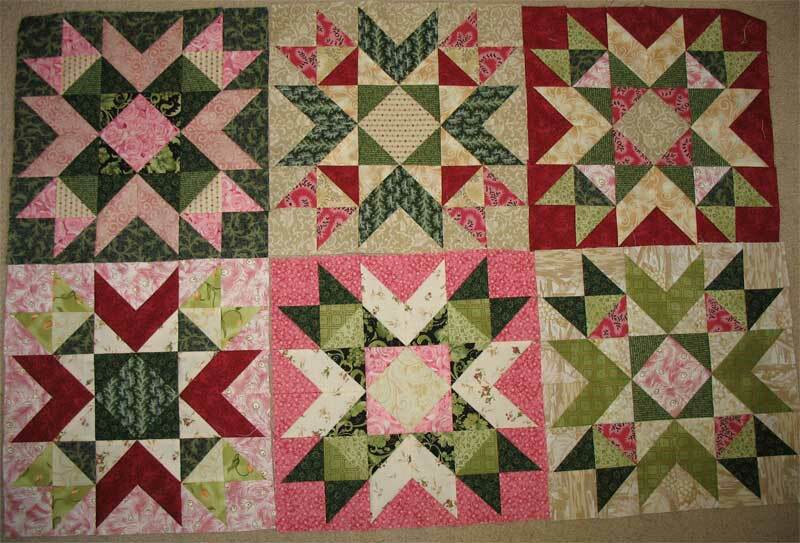 Check out this site for instructions; my blocks were 2" x 4" finished. 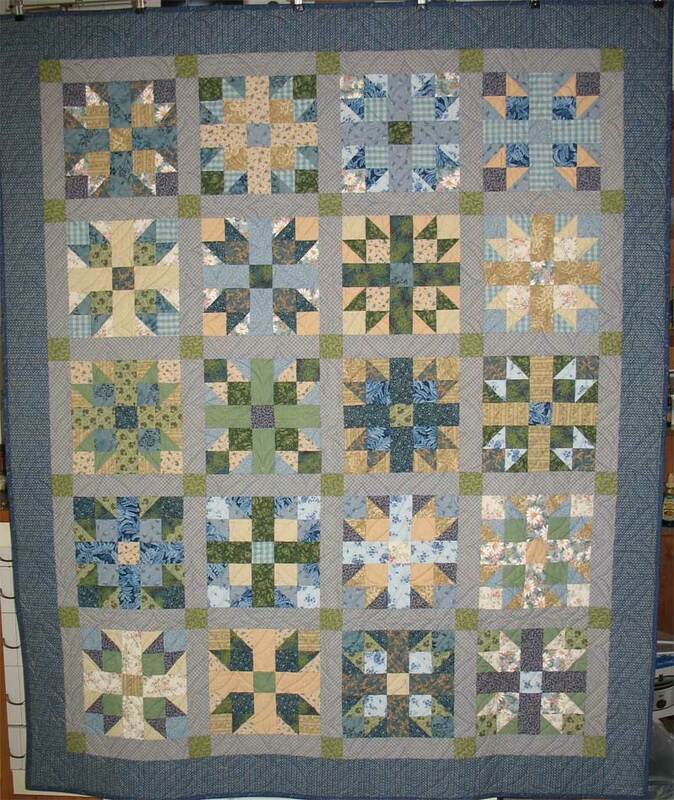 I also constructed it QAYG, so it was r eady to bind as soon as it was pieced. Got to love that. 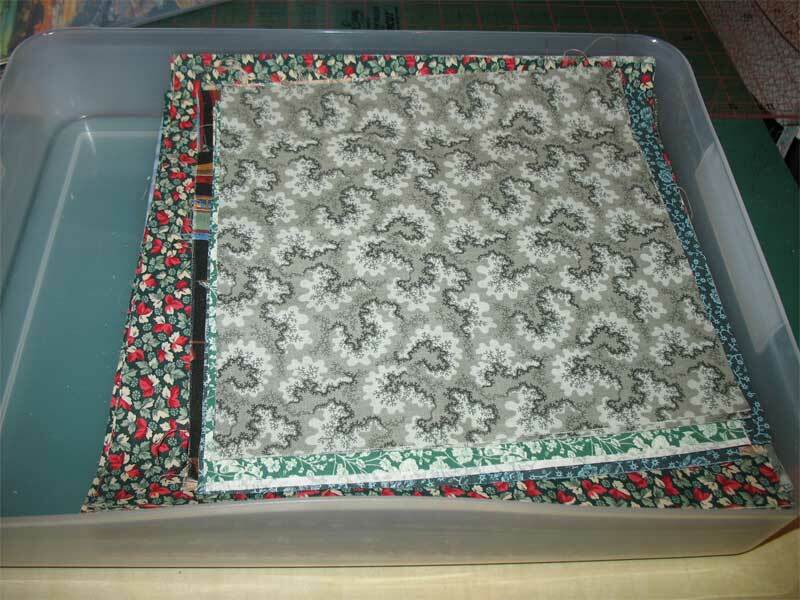 AS I cleaned out boxes I discarded a lot of stuff, and then cut it into 10.5" squares for my pieced backings. Once again the lid won't fit on the box, so I guess I'd better find a bigger box, or piece another backing. 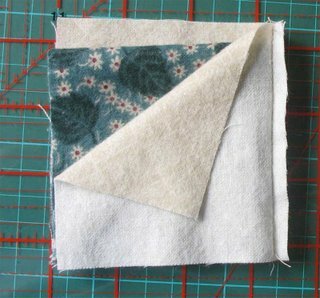 I love how this is using up my ho-hum fabric; once it's pieced I quite like it again. 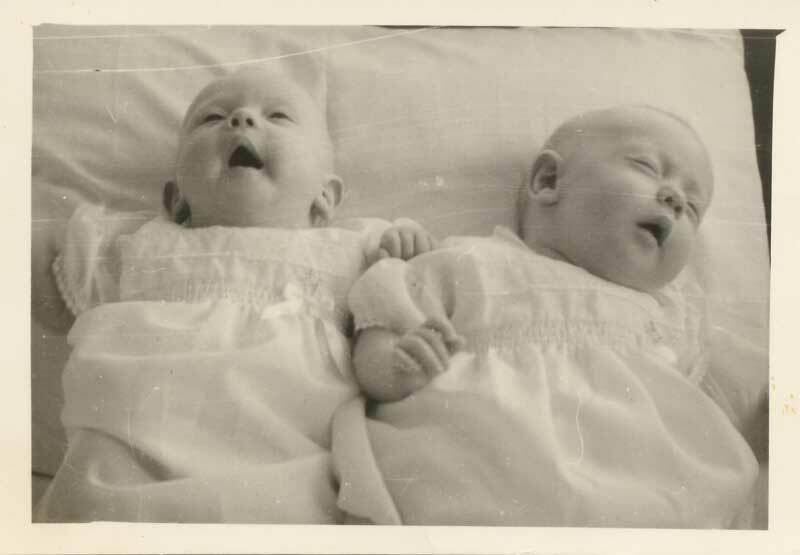 Our birth story had a happy ending because of the efforts of two women; Sister Lewis and Flockie, the attending nurses. The two doctors present were GPs, not obstetricians, it was a difficult birth, and Dad wouldn't let them sacrifice one life for the other. They must have thought they had done all they possibly could do. And when the doctors gave up, and left events to unfold as they would, these two nurses kept trying. In those days the doctors were treated like Gods, to be deferred to in all matters, and the nurses practically curtsied in their presence. So these were strong-willed women to carry on. Sister Lewis kept working on pushing Meredith back, with Flockie looking after Mum, and finally they were able to free Mereth enough so that she could change position and be born. Sister Lewis and Flockie delivered many hundreds of babies in our town, over several decades. They were skilled and dedicated women. The question that occurred to me was, if they all thought Mum would die afterwards, why was Dad left in the waiting room, instead of being by her side? Hospitals were institutions in those days, and the rules were everything. If Meredith had died Mum would not have been allowed to see her; it was standard policy then, not to let mothers even catch sight of the babies they lost. It's hard to comprehend now, but that's the way it was back then. And our Maternity hospital would not let a child under the age of 16 into the waiting room, let alone a ward. Children carried DISEASE, and were to be kept away. They had a point, when whooping cough and measles and chickenpox were endemic. 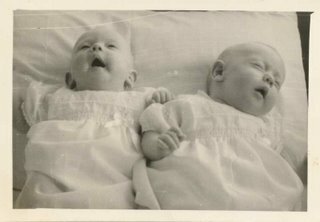 The doctor told Mum that we weren't identical, because we had separate placentas, but they were wrong. Up to a third of identical twins don't share the same placenta. (I just googled it and found out even more useless information...) And our heartbeats were so synchronised that the doctor could only ever hear one heartbeat. This is the one day of the year when I'm a year older than Meredith. We have two older brothers, and Mum was quite happy to leave it at that. But she knew that Dad wanted a daughter badly, and so they decided to have one more baby.With six weeks to go she went to the doctor and he felt her stomach and said "I don't know, all I can feel are feet!" An x-ray confirmed there were two of us, and she and Dad and the doctor stood in the street afterwards looking at our first photo and laughing. For a long while, every time Mum and Dad caught each other's eye they both exclaimed "We're having Twins!" Mum went from the doctor's office to the sewing machine shop, where she arranged to trade her treadle machine in on a new electric Singer. She knew she couldn't sew for two babies with pedal power! After 36 agonising hours, and thanks to the dedicated midwives who wouldn't give up, Meredith finally arrived and was whisked away into a humid crib. Mum, after receiving 8 units of blood through the labour, was parked in a private room to die. She was lying there, drifting away when she heard some people making a noise in the corridor. 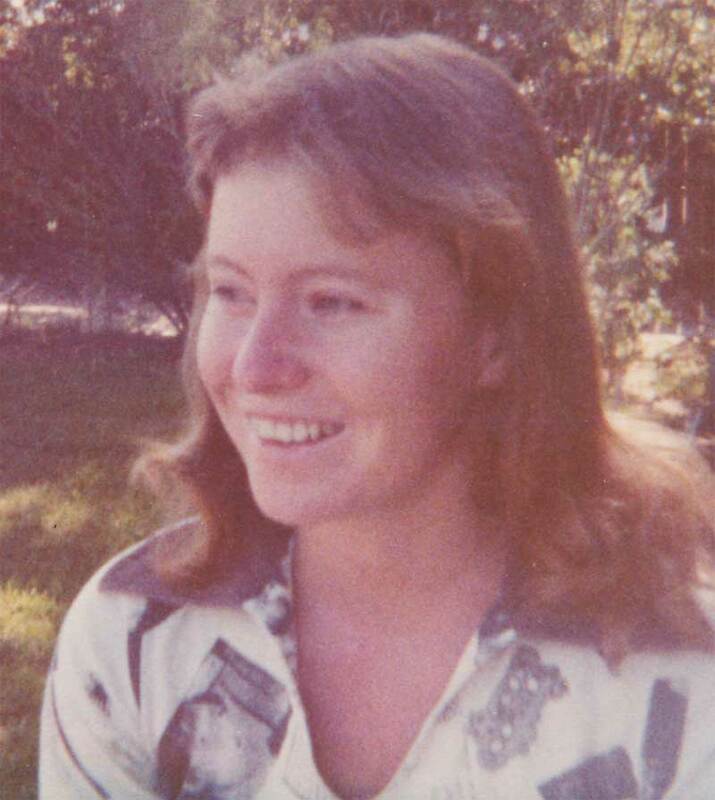 A nurse scolded them into silence 'There is a woman dying in that room, have some consideration!' When it occurred to Mum that they were talking about her she thought 'Dying, ey? I'm not about to die!!' And she started to fight her way back to life. We heard that story a lot of times, and it never fails to amaze. A day and a half is a long time to be in complicated labour, a long time to wait to be born, a long time for an anxious father. I guess I was the only one who had it easy. I went to the library today and borrowed some knitting and quilting books, and this art book. 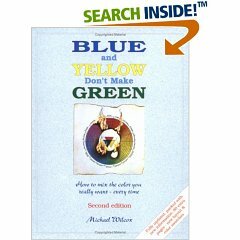 It's called Blue and Yellow Don't Make Green, and it taught me an awful lot about colour the first time I read it. It's meant for artists wanting to mix their own colours, but I find his idea of 6 principle colours instead of three primaries really useful when choosing fabric colours. And when I dye fabrics I have much more control over what I'm doing. It's well worth a read if your library has it. I have to admit that I don't know a lot about colour theory. People have tried to teach me, but I end up thinking 'What's that outside the window....?' while they drone on about it. I like to work by instinct most of the time, and throw away what doesn't work. 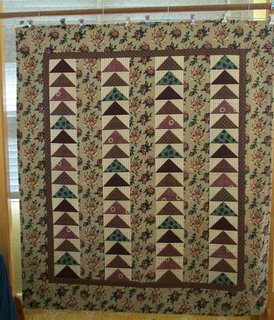 This book taught me why so many pretty prints turn to grey or mauve mush from a distance, wreaking havoc with the quilt's overall look. Why that wonderful dark floral actually reads as a medium-light from a distance. It taught me not to buy prints that I know won't work. It taught me how to choose prints to get the effect I want the first tim e. Other books on colour are just as good, but this one is the one that spoke most strongly to me. I'm busy making my new blocks, and not being too concerned about the theory behind the colours. I just like 'em. 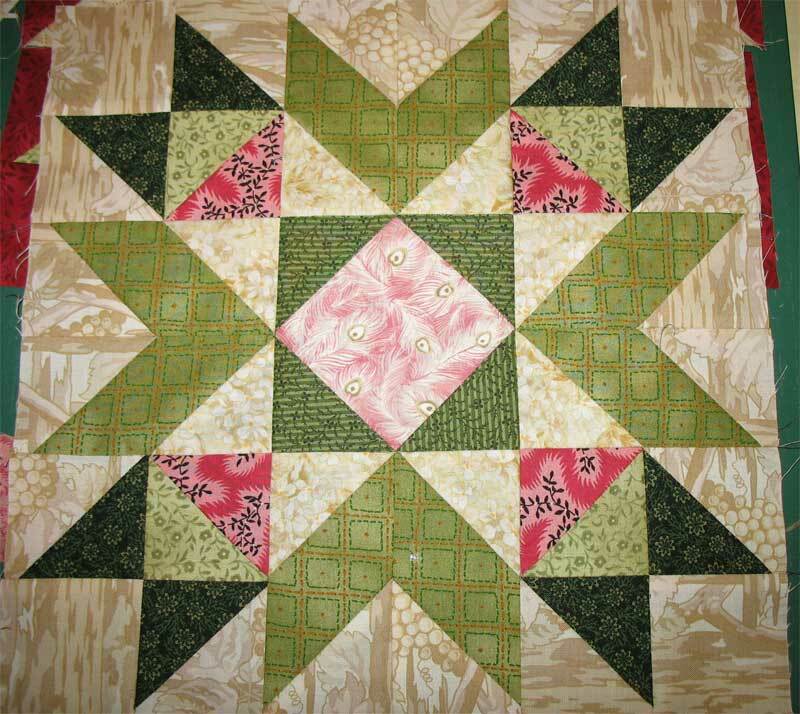 They start out as rail fence blocks, then I turn them into Half Square Triangles and sew them into squares on point. 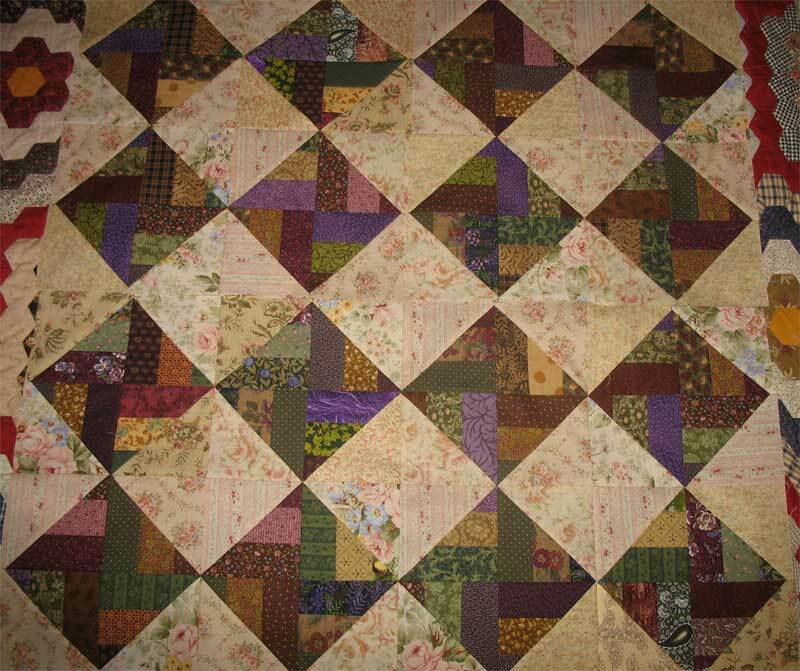 I like the original rail fence blocks so much I might make an entire quilt just out of those. 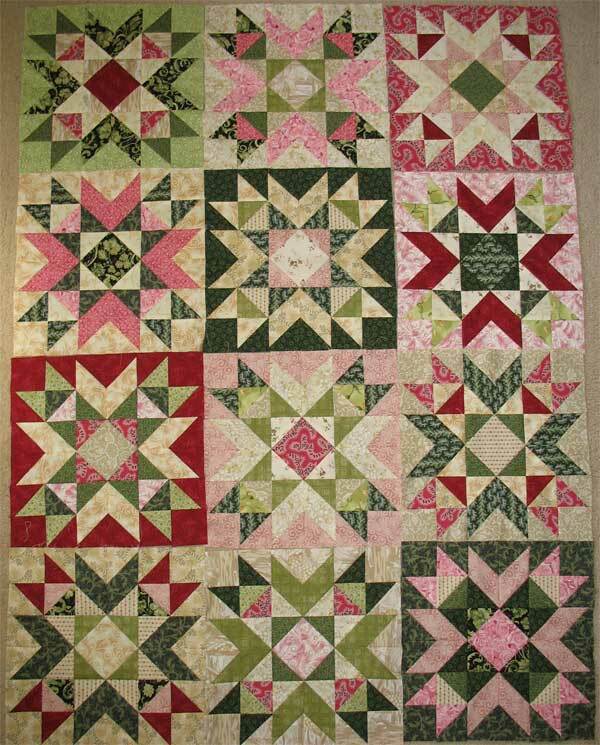 But I also like the soft florals I'm using in the corners of the finished blocks. 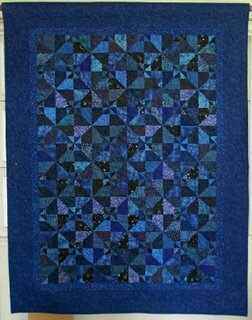 I made another 70" square backing from my 10.5" squares, which cleared some more fabric out of the stash. That's another 3 or 4 metres used, even if it has just been transformed into a single piece of fabric instead of many. I'm still on a roll, even if I'm slowing down a little. 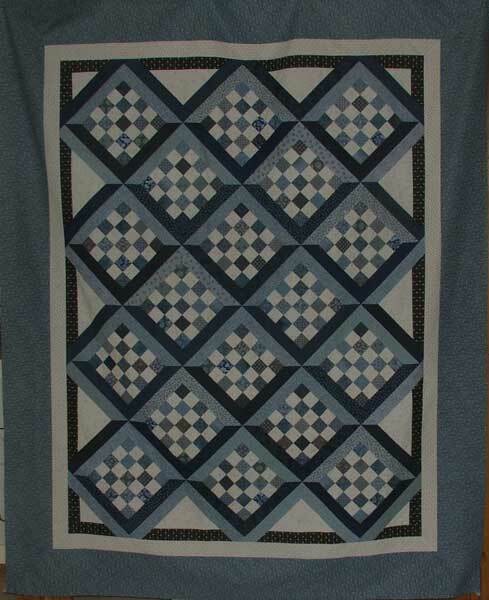 This is the next quilt in the binding pile; another colour sampler. This is one of my favourites, soft and pretty and comfortable. 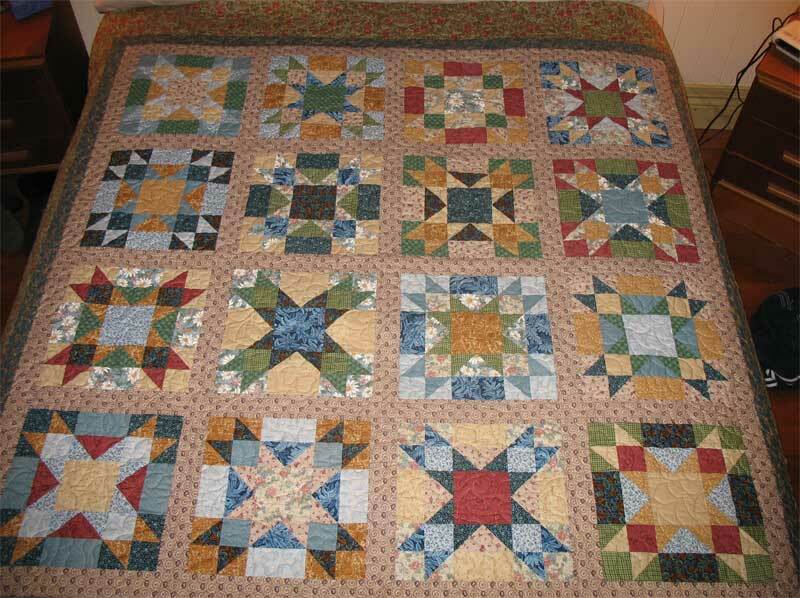 Another quilt that was thoroughly enjoyable to work on, from start to finish. The only problem was, the box I keep my 10.5" squares in was overflowing, so I made two backings first, a blue one and a pastel one. 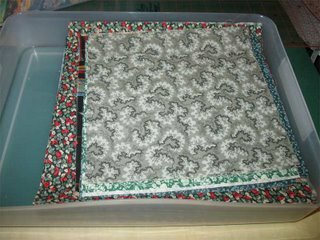 They both have quilts to belong to, so I felt very virtuous as I refilled the box with green squares. 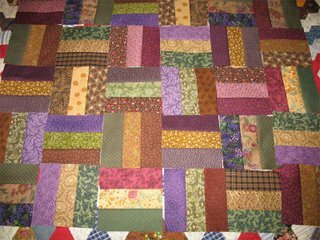 I have been cutting 10.5" squares for my pieced backings, but a lot of the scraps weren't that big. I've started cuttiing 8.5" squares n ow, because I can get those out of a skinny quarter, with nothing left over, thank heavens. I'm using up my fabirc at a great rate. Along the way I played with a new strippy scrappy project I want to do next, and the voice in my head gave up in disgust and went away. Yay! Another small victory for the right-hand side of my brain. Seeing how blah those backings look I can only be glad that I got those fabrics out of my stash; they wouldn't have enhanced any quilt top that I put them in. 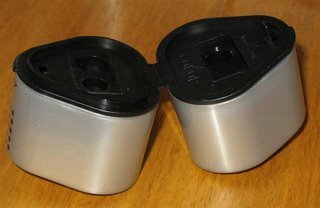 I went to the art shop today to replace my pencil sharpener; I gave Meredith my other one. 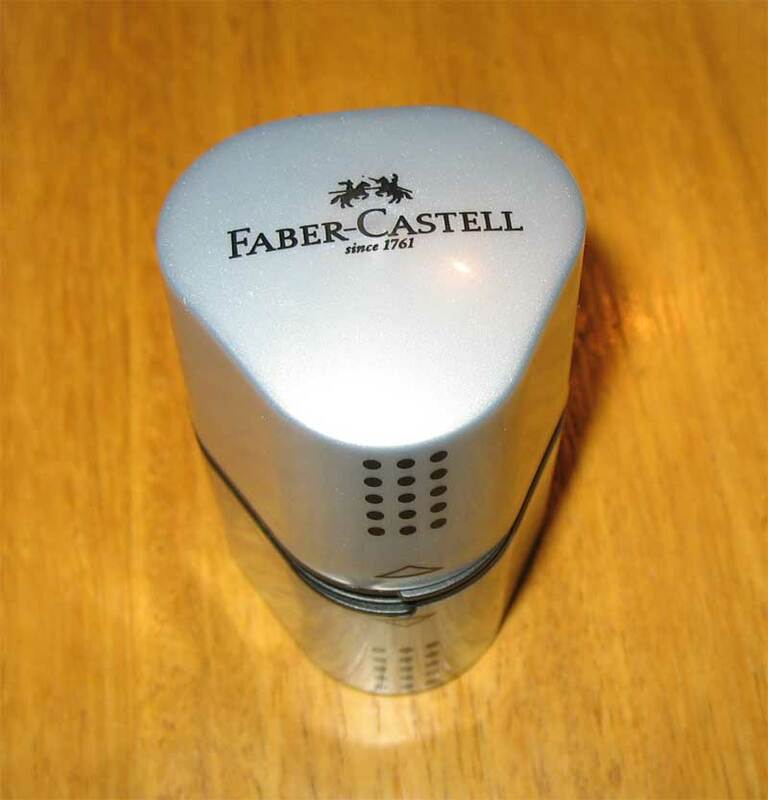 This is the best sharpener ever. At one quilting workshop the sceptical ladies kept fishing out problem pencils from their sewing kits, but this little beauty put a perfect point on all of them. It has never failed me yet; got to love something that doesn't let you down. It has two different angles that you can put on your pencils, and it's brilliant on those fragile ones. Nines asked for pictures of laundry rooms, so here's mine. It's just inside the back door, which is off to the left. It's built into part of the back verandah, and I never do laundry without feeling grateful. 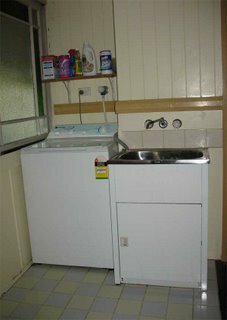 For many years I had to haul all the washing downstairs to a set of concrete sinks, with the washer installed on a high concrete slab. That made it taller, and I couldn't even reach the bottom of the bowl; I had to sort of jump in and swipe things out. That was a lot of fun. It was just bare dirt, and if things fell down they got filthy. I hated it! 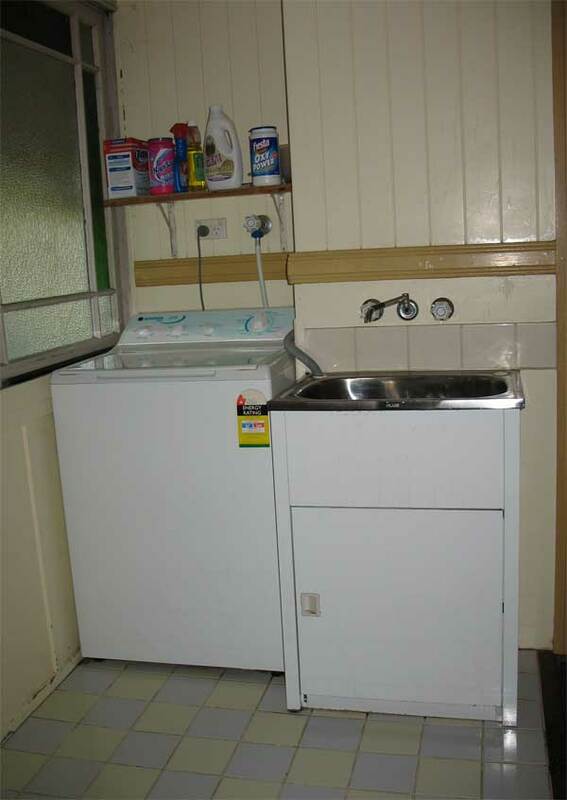 Most highset Queensland houses still have the laundry downstairs, even new ones. I worked on DH for 15 years before I got my washer installed upstairs, and he fought bitterly. He thought it was a silly idea. But he has had to agree that it was the best thing we ever did, besides moving the toilet upstairs. That happened within weeks of buying the house; no way was I going downstairs in the middle of the night. I was adamant. 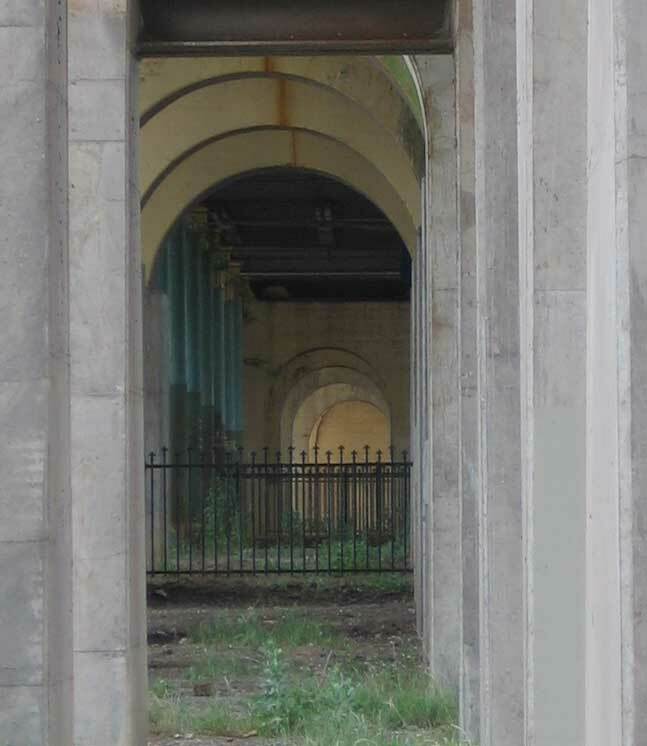 And the picture of arches in one that I took when Meredith and I were in Port Adelaide last year. We drove under the railway bridge and the view was so impressive I made Meredith drive around the block and park on the side of the road while I ran under the bridge and took some photos. The passing traffic thought I was nuts, but the perspective was intruiging. I ask you, is this the proper use of a treadmill? 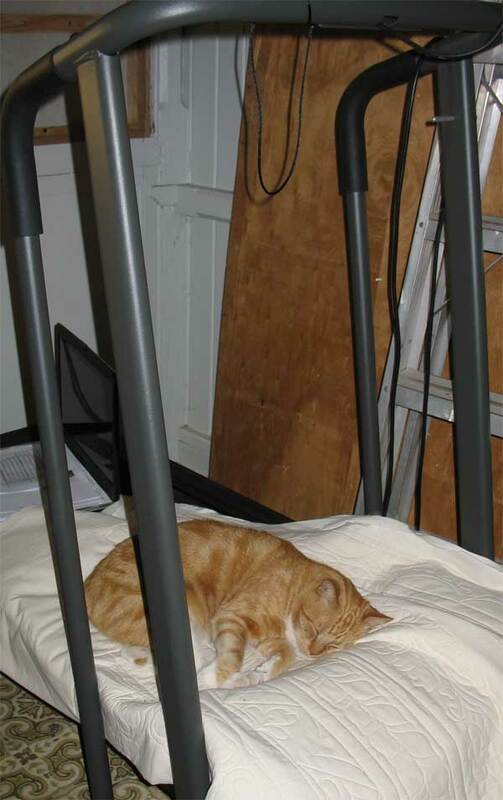 All the cats take turns sleeping on it, and I hate to say that I haven't turfed them off once in the last week. And what is my laptop doing there? I've obviously been distracted. Time to clean up and concentrate on putting things to rights around here. We're having cooler weather thank heavens, so it's much more pleasant to work during the day. On the weekend we'll be working on the room downstairs, so I 'm trying to finish off a few sewing projects before then. Or at least get them organised so that I will know what I was doing when I finally get back to them. 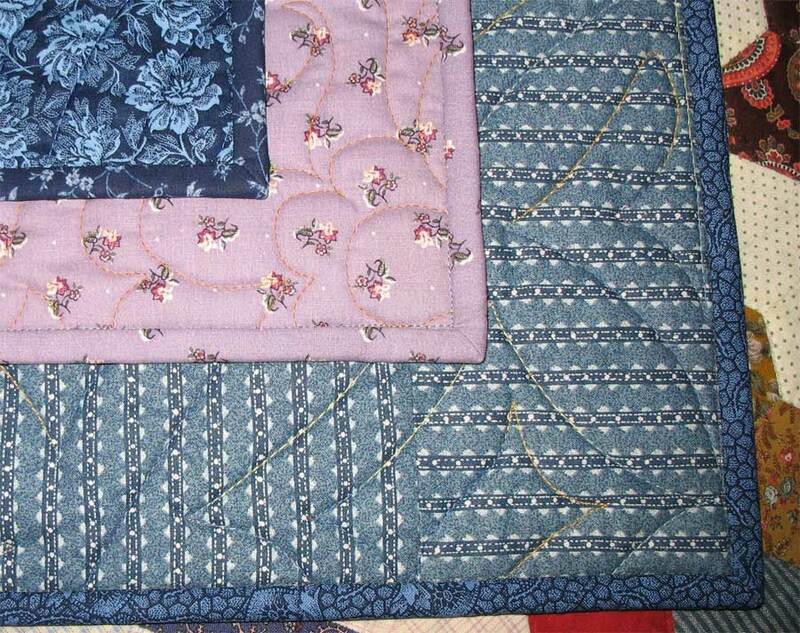 The blue quilt is one of that I bound the other day. 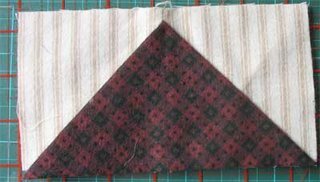 It is also a colour sampler, using a block that I have seen called Rabbit Foot, but I'm sure there are other names for it too. Its a nice simple block to try out the technique. I love blue and green together, it's one of my favourite colour combinations. When I was home in South Australia I had to stop and take photos of the scenery; blue skies and green crops, with the darker blue line of the Flinders Ranges between. Meredith spent years living on a farm, and I used to love driving out to her place. 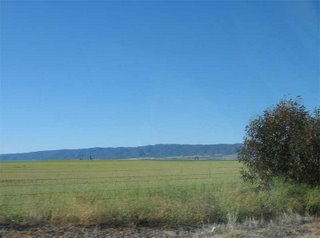 Once I irritated everyone in the car by singing John Denver all the way; 'Thank God I 'm a Country Boy" but I substituted 'girl' of course. Mum said, in an effort to shut me up, "You were born in the city, not the country'. Maybe, but in my heart I'm a country girl. That's three quilts bound and finished. I'm working on a way to hang them up and take photos, so should be full piccies later on. I'm sure these quilts had five sides and five corners! It seemed like I was never going to get back to where I started on each one; I just hate it when you think you're on the last side and there's one more corner that you hadn't counted on.. 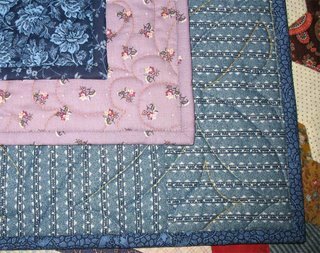 I have two more quilts in the pile, with the bindings prepared, but I found another two in the spare room, so it's like I'm running in place. But I'm still enjoying myself, so I'll just keep on with the finishing off. This is what I will be doing tonight. 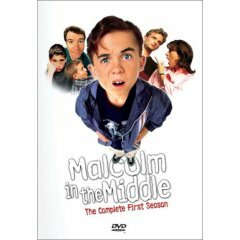 I just love Malcolm In The Middle, and bought myself the first series on DVD. Lois is my hero; what a woman! Even when life is utter chaos she never fails to win; I want to be like her when I grow up. If I had children like hers I'd be in a corner with my pinafore over my head. I imagine most mothers with multiple sons can identify with what she goes through. 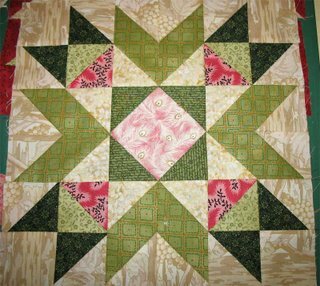 Eileenkny asked about my new release patterns. If you go to this page (the American site) and scroll down, everything from the pattern Limetree onwards are new patterns. Limetree happens to be one of my favourites, I did it on this scrappy bargello I made from the pattern on Bonnie's site and it came out really nice. 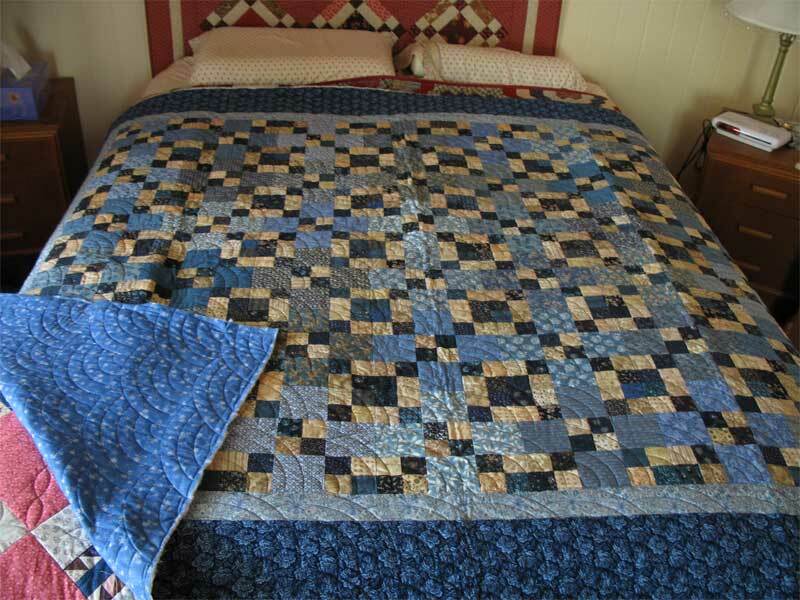 Mereth has the quilt now, so she will have to take some photos to share. Can you remember the feeling when you were a child of r unning downhill so fast that your legs were out of control and you KNEW you were going to fall over and yet you couldn't stop because gravity and momentum were carrying you onward?? That's how I feel now, sewing crazily in every spare minute, not even stopping for coffee, and as soon as something is done I just start on the next thing. 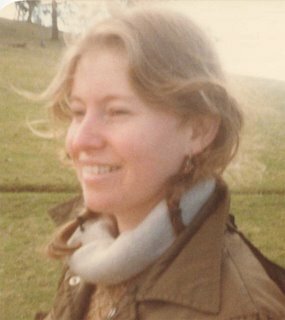 But there was also a feeling of euphoria when you made it to the bottom of the hill unscathed and ran yourself to a stop or fell over in the grass shrieking with laughter. It didn't always end in tears. It's the coffee thing that has me worried.... That is so out of character. 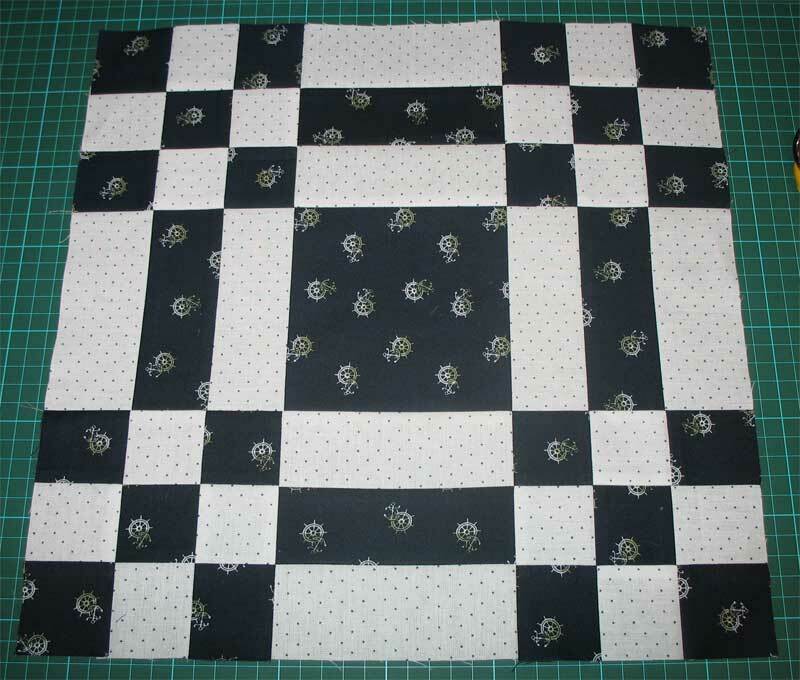 I've been sitting up late at night sewing, which is how I managed to get 14 blocks finished. 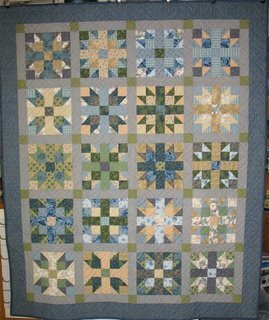 I know I said I was going to kit these up, but I got carried away, and now I'm planning to cut out another quilt and I will most definitely make those blocks into kits. I promise. 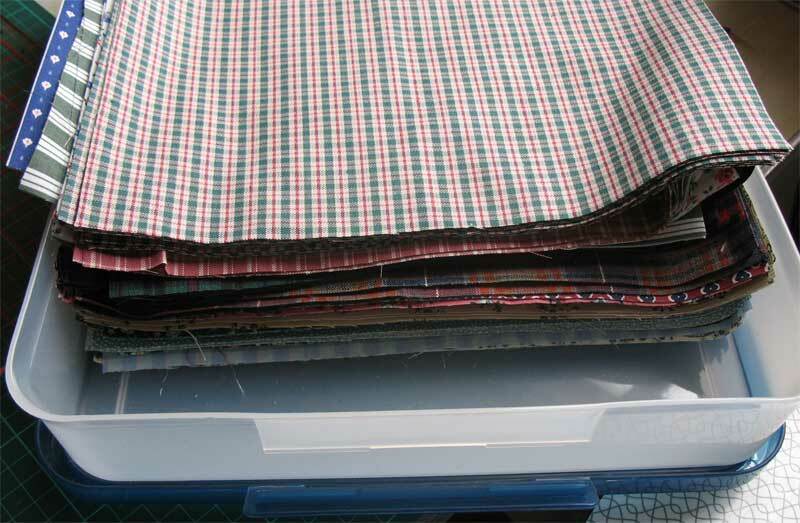 I am still elated at how much fabric I've used up in the last few weeks, and I want to keep on cutting. As I sit by the window, with the cool night air flowing in, I can smell the Star Jasmine that is flowering in the front garden. It's so strong the air is saturated with it, and it's a beautiful companion to my late hours. I love plants like this, that will tolerate all the neglect I dish out; I enjoy my garden, but sometimes there aren't enough hours in the day to look after it all. 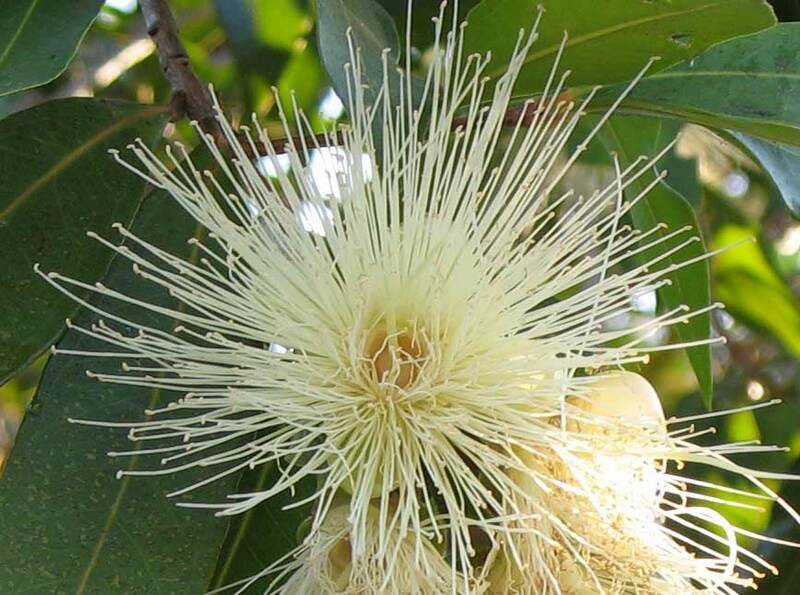 There was a new fragrance this afternoon; this Bush Apple, which is a type of eucalypt. 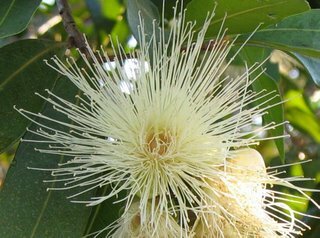 It's covered in these 4" puffball flowers, and they're full of nectar. 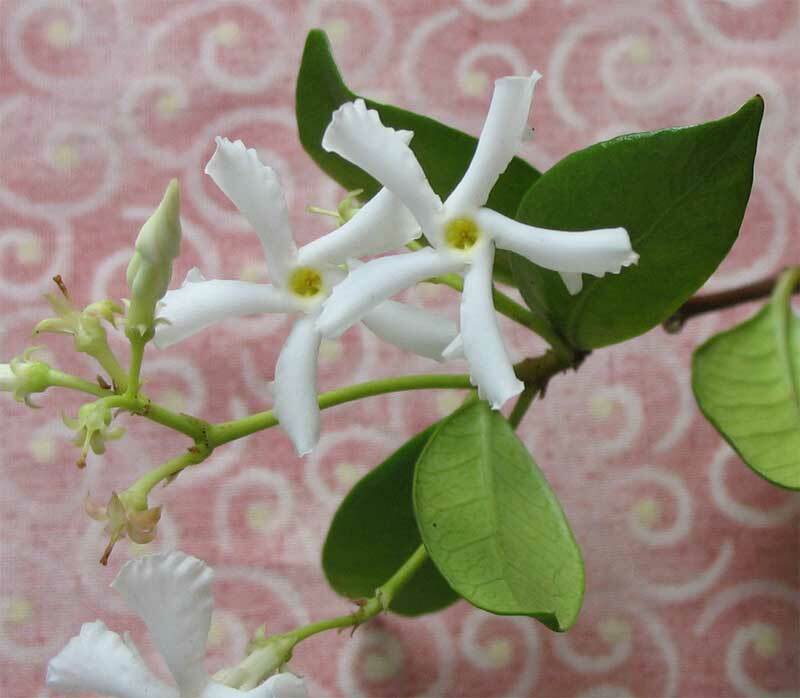 The smell is different from the jasmine, and stronger in the daytime. 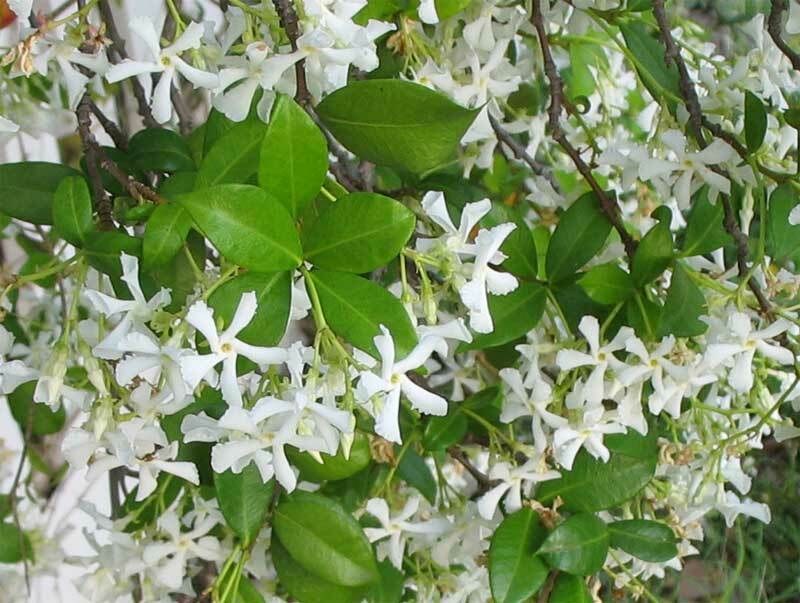 No matter what time I sit and sew, there is a wonderful scent. I'm quietly grateful. My blocks are proving fun to piece, and I'm deliberately trying to make them all look different, even though they are all the same block. The technique I'm using is one I teach in my Colour Sampler workshop. 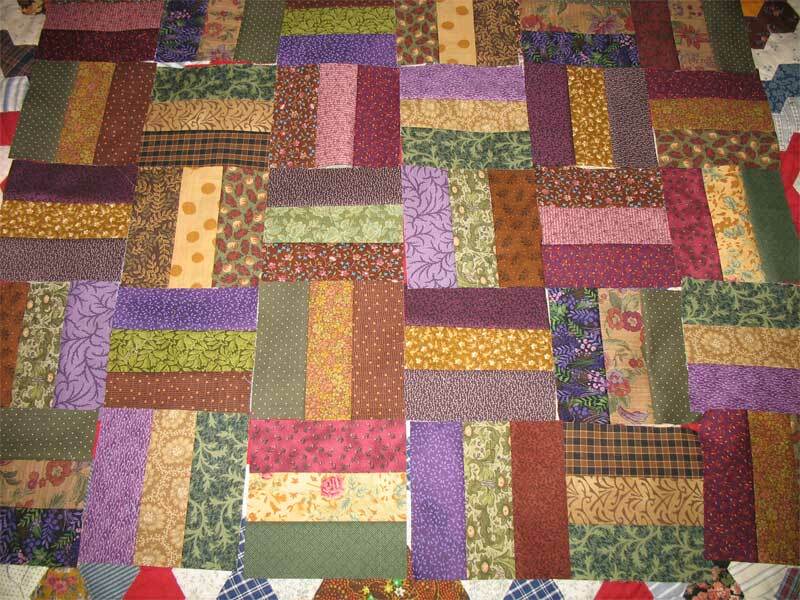 I choose a block that can be coloured in a variety of ways, and select a FQ for each block I want to make. Then I cut all the peices for that block from each FQ. 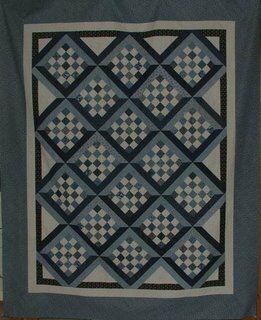 The whole quilt is cut out at once, which makes it ideal to do as a kit. 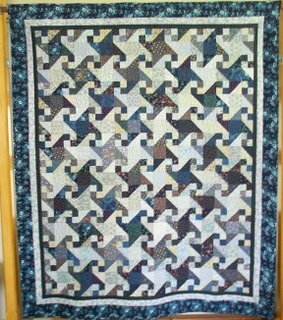 Then I can sit down at my leisure and play with all the pieces like a giant jigsaw puzzle, deciding what will go where. 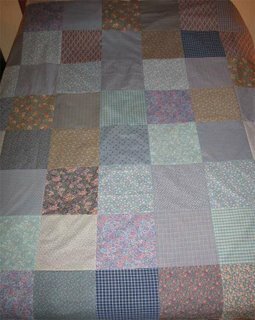 I've made 6 or 7 of these, and it's still one of my favourite ways to build a quilt. 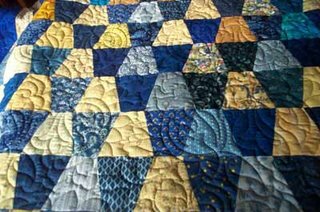 It is such an effort to make this sort of quilt without a system, there are so many decisions about what to put where and then you have to cut the fabric after you've decided where to use it. With this method all the fabric choices are made at the start, there are no decisions to make about what to cut, and the blocks are built once all the hard preparation work is done. Another thing I like is that I end up making blocks that are far removed from my usual safe choices, purely because I've used up all the safe variations and I have to do something else with the remaning bits. 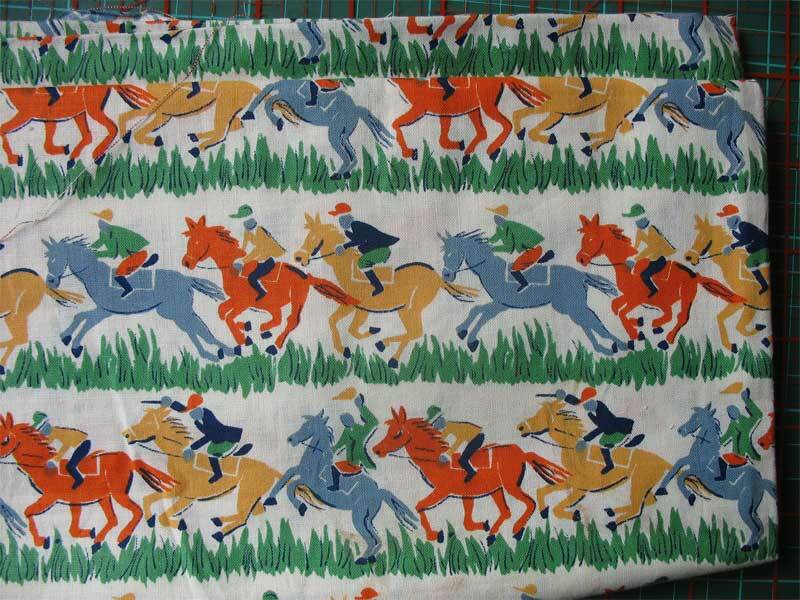 Each fabric will only show up in the same place in a block once, which adds lots of variety. 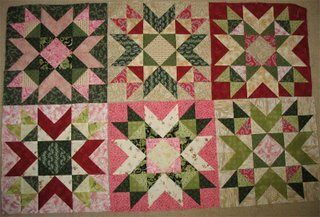 Currently my favourite block is the bright pink one in the lower row; I'm not brave enough on my own to place those fabric like that. However, once I got to playing around with the pieces I decided I liked it a lot! We always have great fun when I teach this; everyone is surprised by the possibilities and the different blocks they can make. 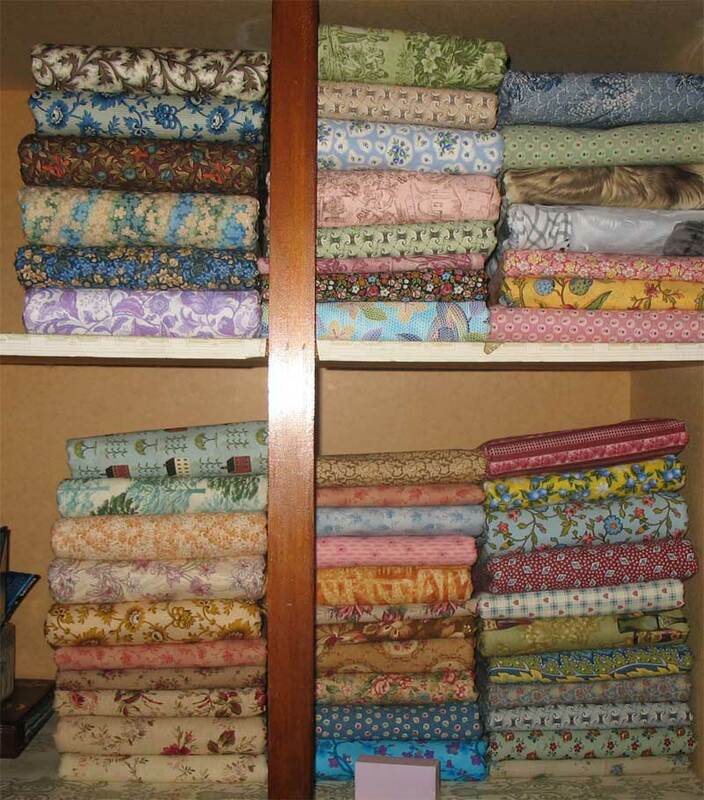 The hardest thing is choosing the fabrics at the start. 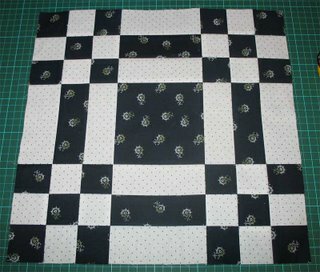 In an attempt to use up some of said fabric, I cut out 24 12" blocks for a new quilt. 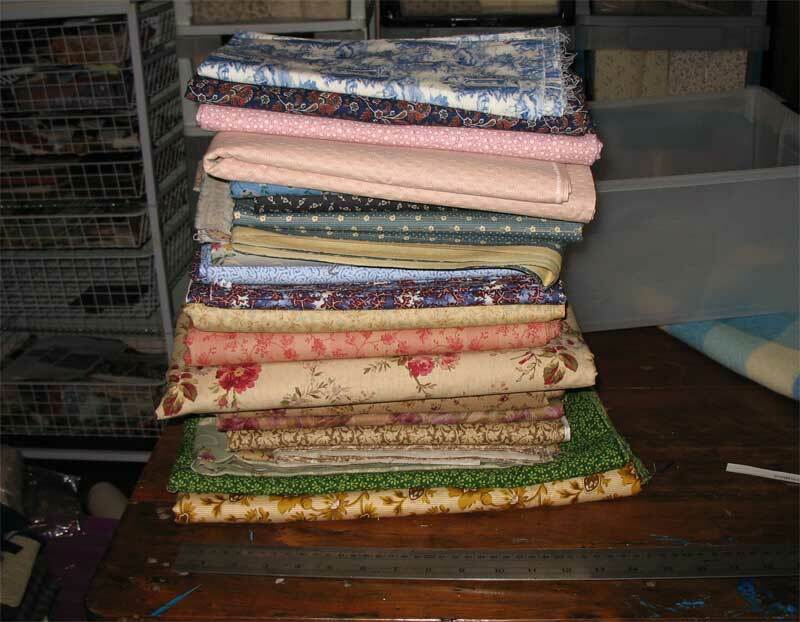 Each block uses more than a FQ, so I was gleeful that I'd used up 5.5 metres; then I realised that there are the equivalent of 10 similar quilts in that stack of fabric alone. At times like that I need to have a cup of coffee and sit in a corner trembling slightly. The odd thing is that I would feel lost without my stash, so I could never get rid of it; I just wish it were better housed and I could use it more. 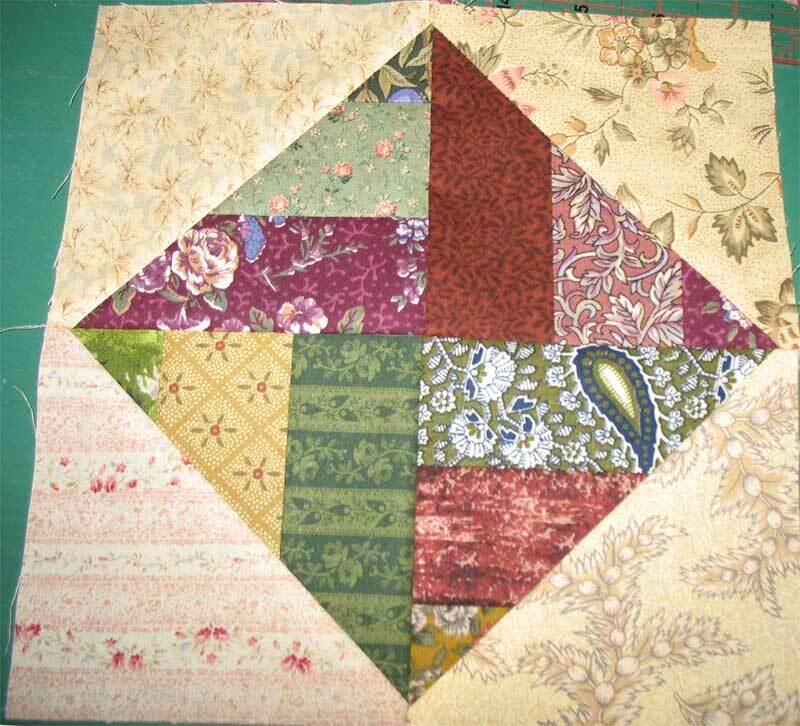 I have no idea of the name of this block, it was just drawn out in my graph book, complete with cutting chart, so on the spur of the moment I started cutting. 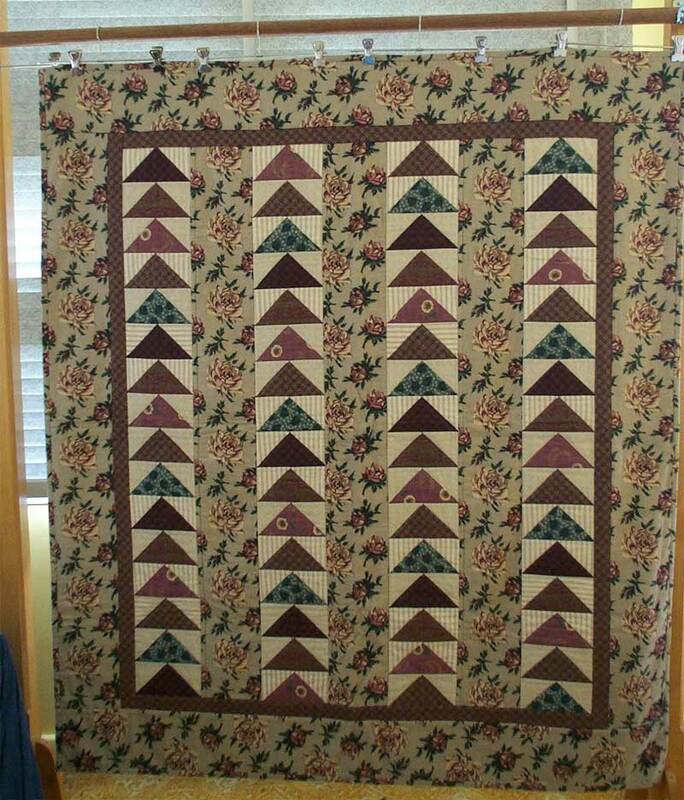 There are 57 pieces in each block, and it takes a while to piece. I think I was a bit dismayed at how quickly I finished the Grey Havens top, and I won't be finishing This in a hurry! 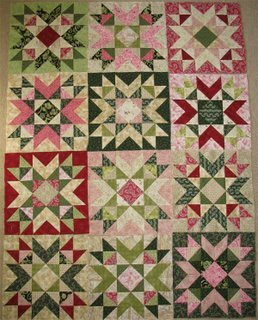 I'm a bit partial to red and green and cream right now, and it makes a change from the darker blocks I've been working on lately. I don't need to do this all at once either; it's all bagged up neatly in little sandwich bags waiting for me to get round to it. 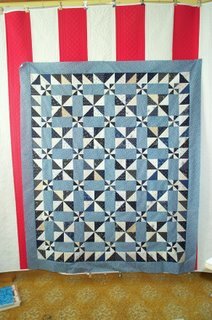 I love kitting quilts up like that, and I aim to make one kit a week for the next month. Then when the hot weather comes and I have to stay in the A/C I can just pull out a kit and work on it. DH is away for a few days, and we're living like gypsies, eating whatever we like, staying up all hours of the night and (this is the big thing) in control of the TV! I have not had to watch a single car being 'tricked out', or witness a workshop fight between two bearded prima dons (is that the masculine form of prima donna?) and it's been a huge relief. 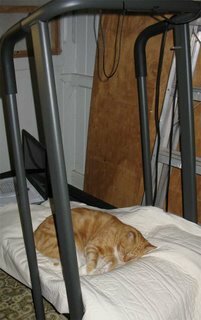 DH likes me to sit and watch TV with him at night, but if I didn't have my sewing or knitting I would be climbing the walls. It's not even boredom; those shows just get me so angry and frustrated because I don't believe in any of that shallow claptrap. I can't believe that you will have a better life if someone steals your car and paints flames all over it as a treat for you. And even the interesting parts like how they fabricate the pieces is spoiled by the posturings and poutings and simulated crises "Oh no, there's a world wide shortage of charcoal grey metallic pigment paint.." "The engine is touching the firewall, how could that have happened!!!" The rubbish outweighs the interest for me, but DH likes to see the car at the end.